Notes: Undergoing rebuilding to SD70ACC 1825. Description: Train 274 amidst fall colors. Title: Busy day at Oakdale, TN. Description: Two in the hole and one on the main at Oakdale, TN. Description: Eastbound up the West Slope at MP 254. Description: NS #2507 leads a long intermodal train under the Railfan Overlook bridge at Cassandra, PA. Description: Westbound coal empties crossing big trestle at Coopers WV. Description: NS 91Q backs around the north leg of the wye at Salisbury to couple to its empty ballast train before heading west. Grimes Mill is a state historic site. 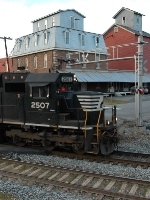 Description: NS engine #2507 with an ex-Conrail unit and an empty coal train at Guilford's East Deerfield yard. Description: NS 2507 leads Train 146 under the cantilever at Peltons, east of the C&O diamonds. Description: NS 146 approaches Town St, and Blair yard. Description: One reason I like NS, big power with standard cabs! Here two newer units with standard cabs roll into Northtown with the NSI. Description: The daily Norfolk Southern Interchange comes into Northtown Yard at 44th with an SD70 trailing. 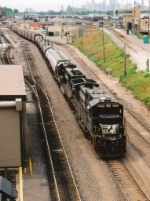 Description: The trailing NS SD70. Description: NS Northbound Freight Train pulling into NS'S Norris Yard in Irondale, Al. Description: It's another return to Phillipsburg. After about 20 minutes of waiting after arrival, 214 rides north. Description: Over the Raritan River on the CSAO Lehigh Line, 0849 hoous.